In a continuing effort to improve space combat, a couple new features have been added. 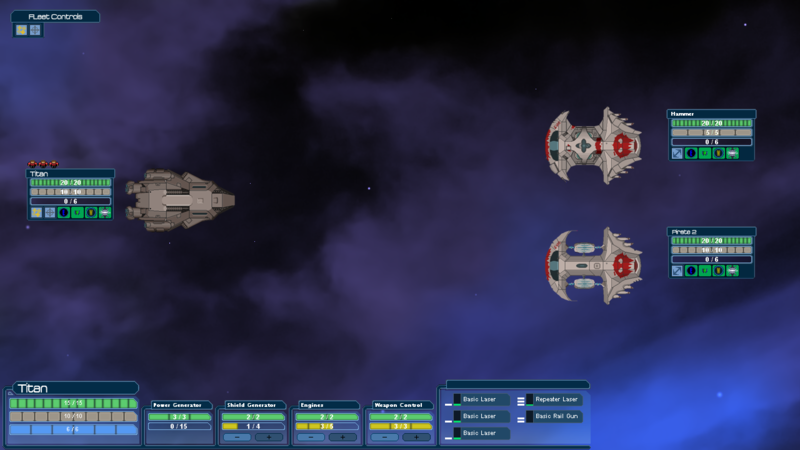 First off ships now have armor in addition to health and shields. Damage to the ship happens in the order Shield > Armor > Health. There will be certain weapons that can penetrate shields and others that can penetrate armor, making it critical to use your weapons in the correct order to maximize the damage. The second addition is the new Fleet View. Aurora Rising supports fighting multiple ships, as well as having ally ships fight along side you. You do not have direct control over ally ships but with the new Fleet View you will be able to issue orders to your fleet (including targeting a specific ship/system or letting your allies choose their own targets). You will also be able to easily keep track of your crew if they are on more than one ship, with the crew icons appearing above the ships they are on. Combat will begin in the Fleet View, giving you a good overview of the battle at hand. You can zoom in on any of the ships by clicking them, and zoom out again by pressing "Backspace" (or whatever key you bind to that function). Pressing "Backspace" in Fleet View will automatically zoom in on your ship. I am hoping to get a gameplay video of Fleet View in action up in the next couple of days. Fleet action combat. That is really cool. This the exact thing I would have wished for in an FTL-like successor.